Four guns created by an unknown super-civilisation. 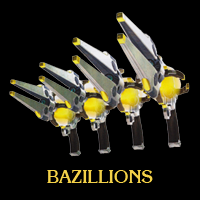 Powered by an energy source known as Bazillionium, the brilliant flash from the guns instantly break down the molecular bonds within its target. Able to discern the intent of its user, it is said that the strange, miraculous guns have the power to open a portal to another dimension. Thanks to Rodin, the guns also have gained demonic powers, making them an incredible threat to the denizens of Paradiso.